There is an oft-lamented dearth of strong female characters in cinema. Lt. Ripley and Sarah Connor are the characters that receive the most citation, but I’ll be damned if we can’t add Ree Dolly to the roster – this is not a girl to be trifled with. Ree’s only seventeen, but she cooks, chops wood, and does anything else it takes to take care of her younger brother, sister and their catatonic mother. Despite her efforts, times are tight, with the Dolly clan relying on neighborly aid to keep mouths fed. When the police come by to ask about their meth-cooking father, Ree gets a shock: to stay out of jail, he signed over the house as collateral and he’s now disappeared. If Ree can’t find her father, the family will be tossed out and the house seized. Director Debra Granik’s background in documentary cinema blooms into fruition with the depiction of the harsh winter landscapes of the Missouri Ozarks. Naked trees and gray skies accent the patchwork of DIY house repairs, tire piles, and other assorted pieces of trash/supplies accent the community’s abodes. Despite the financial troubles and unforgiving cold, Ree tells her brother, “Never ask for what ought to be offered.” Absent are credit cards and a world of easy fixes. To make it in this land you need pounds of self-reliance and equal amounts of support from kith and kin. Ree’s quest for her father yields unsettling possibilities, elucidated by the community’s warnings and obfuscations. Ree is determined though. Though guns are a part of life in the region, Ree is able to side-step the need for gunpowder by being an immovable object – anyone in her way crashes impotently against her like Smart cars vs a sixteen-wheeler. Personal consequences be damned, her family’s on the line–and this cultural attitude is one her adversaries fear and respect. Winter’s Bone deserves a viewing for its bleak visuals (an uncredited main character) and the raw performance from Jennifer Lawrence as Ree. Uncompromised by the usual sexualized overtones and a determined attitude that belies the whiny wimpy trappings of other female characters stuck in a rut, Lawrence is just awesome. Her steely gunslinger gaze and the nobility of her quest come through her graceful and intimidating performance. The film is also a cultural snapshot of the Ozarks and similar regions. Meth has become a scourge upon rural communities like the one featured, highlighting the contemporary drug issues of the agrarian poor. * Though men are the main puppeteers in Winter’s Bone, it’s the women who are always willing to help Ree – though at times that aid comes with a black eye and bruised ribs. Couple all of this with the film’s portrayal of poverty without condescension or pity, and the quiet love Ree displays for her young siblings via gun lessons and math quizzes, and the poor can claim a new, authentic, hero. Winter’s Bone has twinges of the hopeful as much as the dangerous. As Ree tries to find her father, you quickly become anxious to see things go well for her as so much goes wrong. Winter’s Bone impresses with personal storytelling, excellent performances, and wider cultural implications. 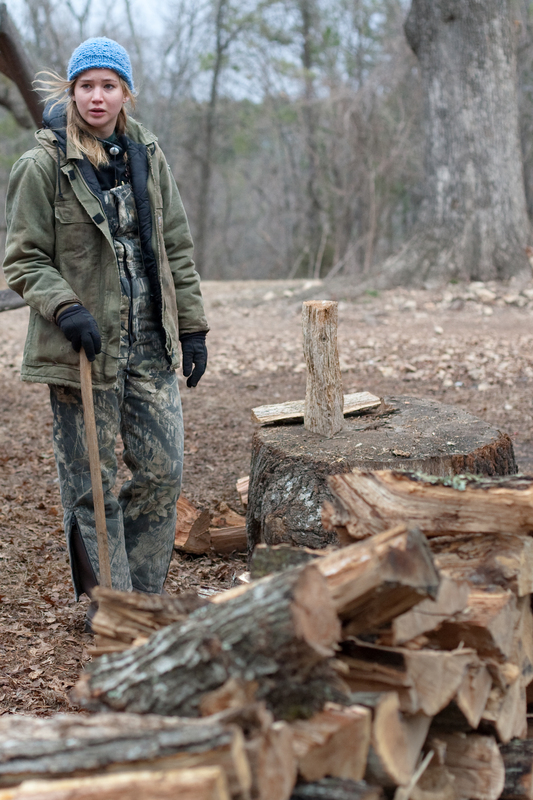 You need to see Winter’s Bone if for nothing else than to learn how to be a badass without a gun. *As a Kentucky local, the Missouri Ozarks region of poverty, community, and self-reliance (even in matters that would normally be handled by police) share uncanny similarities to the real life Appalachian communities I’ve seen first-hand (my wife is from infamous coal mining town, Harlan, Kentucky). There is an authenticity of rural poverty on display few films could capture (not that many films try to capture poverty; they’re usually making fun of the poor or weighing them down with liberal condescension). I’m also not surprised that Jennifer Lawrence is a Kentucky native. This entry was posted in Edinburgh International Film Festival, Filmsmith Faves, Reviews and tagged Appalachia, Cinema, Debra Granik, Documentary, Drama, Edinburgh International Film Festival, EIFF, female, feminism, Film, Jennifer Lawrence, Kentucky, Movie, patriarchy, poor, poverty, Ree Dolly, strong, strong female character, Sundance, Winter's Bone. Bookmark the permalink.